July is one of the most aromatic months that we have. I love those hot, quiet afternoons. The plants sway gently in a light breeze and the bees buzz. The hummingbirds dart around in search of nectar and the aroma is the most inspiring that you have ever experienced. You really have to make yourself take the time to stop and enjoy nature at its best. Easy to say, eh? We are juggling a new website with re-organizing our offices, storage and work areas. Summer is usually a quieter time which is why we planned these changes now, but we forgot to take into consideration our new retail shop. This is tourist season, so it can be quite busy in downtown Courtenay. When Green Valley first started all those years ago, we made the name of our webpage 57aromas as at that time we had 57 different types of essential oils. It amused me as it was like the Heinz company with its 57 varieties. Now we have 115 different essential oils and blends. 115aromas doesn’t quite sound the same, does it? Petitgrain essential oil is a middle note that is steam distilled from the twigs and leaves of the bitter orange tree. From the same tree we also get Bitter Orange essential oil from the orange fruit and Neroli essential oil from the blossoms. Petitgrain essential oil is an anti-depressant. While this oil is not as popular as Orange, you have to remember that Orange essential oil is a photosensitizer while Petitgrain is not. We have a blend of Petitgrain essential oil, Bitter Orange essential oil and Neroli essential oil that was created for people with SAD Syndrome (seasonal affective disorder) or the winter blues. We call it Sunshine. Some of Petitgrain’s other properties include anti-spasmodic, anti-septic and sedative. Nervine is another useful component. I find it so amazing that nature has provided us with a gentle way to heal our fraught, overworked nerves. Petitgrain essential oil is also a tonic to help our body to recover after it has been sick. Our Elevate the Spirit blend came to be when the Elevate the Arts Festival took place in front of our retail location in downtown Courtenay last summer. We wanted to join in on the celebrations and thought a blend to boost the spirit and creativity would be a great way. When your spirit is high, you feel so light and weightless like nothing is pulling you down. It is wonderful. To create this blend I had to find oils that were uplifting and stimulating as well as oils that help to alleviate aches and pains. Elevate the Spirit is made up from Amyris essential oil, Grapefruit essential oil, Black Pepper essential oil, Rose Geranium essential oil, Cedarwood essential oil, Spearmint essential oil, Ylang Ylang essential oil and Vanilla boosted extract. Amyris essential oil is sometimes known as West Indian Sandalwood as it has similar properties to Sandalwood. As a base note, Amyris is a good sedative, relieves stress and is calming. Grapefruit essential oil is a top note, is an emotional stimulant and is great for mental fatigue, depression and nervous exhaustion. Black Pepper essential oil is a middle note. This oil is an aphrodisiac, a diuretic and a decongestant. Rose Geranium essential oil, a middle note, is antidepressant, emotionally uplifting and balancing. Spearmint essential oil is considered to be cephalic and good with respiratory problems. Being a top note, this oil is a good stimulant. Ylang Ylang essential oil, a base note, is a good sedative and antidepressant. Ylang Ylang can help to slow down rapid breathing and is calming and balancing. Vanilla boosted extract is a base note and makes a wonderful addition to essential oil blends. You can see how all of these properties go together to create an uplifting blend to elevate the spirit. Grapeseed oil contains vitamins (including Vitamin E), minerals, polyunsaturates, protein and linoleic acid 68 to 76%, which are all very important for the skin and cellular membranes. 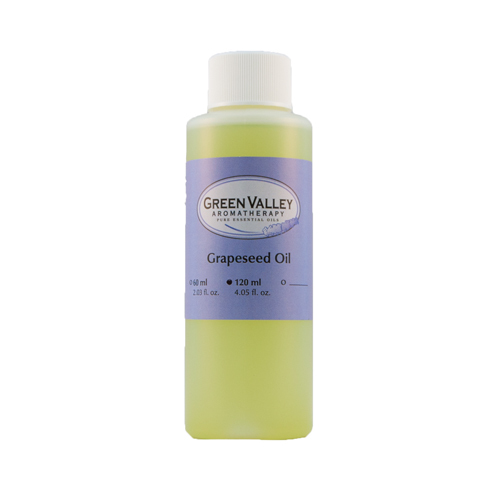 Grapeseed oil is a penetrating, odourless, mildly astringent oil that is great for all skin types. This carrier oil is popular with massage therapists as it is reasonably priced, is good for all skin types and is safe for people with nut allergies. Anxiety is one of the problems that doctors have to deal with a lot. Everyone, at some time in their life, has experienced anxiety at some level. When it is not treated properly or soon enough, anxiety can lead to many physical problems such as migraines, digestive problems, tight muscles, insomnia and heart disease. Fortunately, in Aromatherapy we have a lot of anti-anxiety and sedative essential oils to work with. Roman Chamomile, Jasmine, Juniper, Lavender, Benzoin, Cypress, Frankincense, Geranium, Marjoram, Melissa, Neroli, Patchouli, Rose, Sandalwood and Ylang Ylang are some great examples. They all have subtle differences between them. Choose the oils that you like or that are suitable for a client. It doesn’t matter how many different essential oils you choose as long as you end up with 30 drops of essential oil to 30mls of carrier oil. This is my choice as it suits my symptoms. After partying all night, you may have to get up for work, try a blend of Petitgrain essential oil, Rosemary essential oil and Orange essential oil. These oils are great for that morning wake up shower or bath. Blend together equal amounts of each essential oil. Add 8 drops to your morning bath or 8 drops to your soapy hands and wash all over your body. Rinse off and try to air dry as much as possible. The 2015 report in the Journal of Agricultural Food and Chemistry shows that frozen products are just as healthy as fresh, refrigerated produce. The frozen ones often have a higher nutrient content. The journey from the field to the grocery store is a long one and vitamins break down over time.